We have been industry leaders in Rx-to-OTC Switch for nearly 30 years and have worked on 85% of the drugs and devices that have been successfully switched! 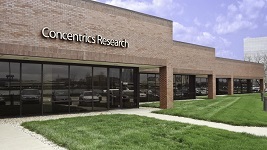 Concentrics Research is a unique CRO specializing in late-stage (Phase II-IV) research. With nearly 30 years of expertise in clinical research and regulated healthcare marketing research. Thinking about your goals from every angle allows us to explore a variety of possibilities. Our knowledge is gathered from many fields including clinical, market research, regulatory, and medical. Our ultimate contribution is to improve the health and quality of life for consumers. Concentrics Research is a unique CRO specializing in late-stage (Phase II-IV) and consumer healthcare research. We have a clinical division, a regulated healthcare market research division and we have a unique research site that allows us to conduct early iterative testing and single site testing for larger studies. With nearly 30 years of expertise in Rx-to-OTC Switch, clinical research and regulated healthcare marketing research, we create and execute custom research to meet your needs. At Concentrics, we’re centered around you-your specific drug or device, your specific research needs, your commercialization goals. No two studies are exactly the same. Our staff of 100 specialists surrounds your team and your drug/device with concentric circles of knowledge, experience, service, and performance excellence. The discipline of good science combined with creative and strategic thinking provides a powerful framework. We start with your goals in mind and work backwards from each of them to assure that we have built innovative and effective solutions. Often these goals can be integrated to save time and money. Concentrics Research has proudly held national certification as a Women’s Business Enterprise since March of 2010.